Definitely one of the prettiest prairie flowers blooming in early spring. This perennial has basal only oblong leaves. Flowering stalk grows from the rosette of leaves and can carry several blooms that hang downward. 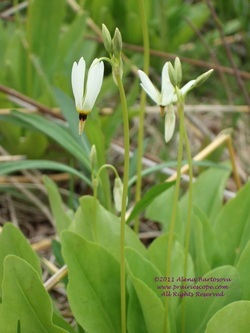 Five white or pink petals reflex upwards, resembling the tail of a shooting star.